The moral of today's story is a simple one. Listen to the skeptics and the contrarians. You dismiss them at your peril. Unfortunately, I did not write down either the author's name or the title of the article. On Aug 22 and 23, David, David's father-in-law, and I — along with neighbor Chris and my wife Becky — laid five pallets of sod in David's back yard. Here is the sod ready to be moved into place. 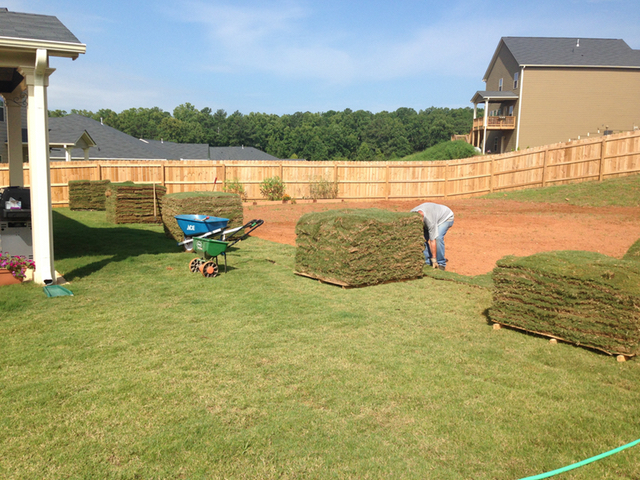 We started by individually picking up a piece of sod, carrying it to its destination, and laying it in place. The old men managed this for a few hours but eventually, we gave out. We switched to carrying sod to David who would lay it. We timed things so that one of us would be going out to give the next piece to David while the other was coming back to get another. This almost tripled our throughput. After long wearying hours, David decided that we could use the wheelbarrow to load the sod up. Why we didn't think of this sooner is one of life's great mysteries. The next time I have to do this I'll know how to go about it. But there isn't going to be a next time. I'll pay for someone to do it, first.